Is punctuation important for passing the IELTS Writing Exam? Yes, it is! It is very important. If a student makes mistakes in basic punctuation, it tells the examiner that the student’s English is not good enough. First, though, you should be familiar with the different types of sentence. 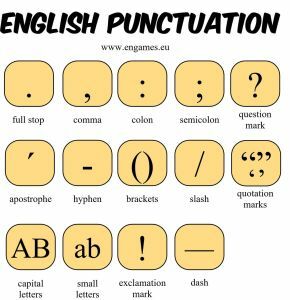 So let’s review the basic rules of English punctuation. Note that there are far more rules for comma use than any other form of punctuation. If you have trouble understanding these rules, review the sentence types and clauses. Use a comma when you need to join two independent clauses (in a compound sentence). Those books were expensive, but they will be very useful. The storm last night was really wild, so I expect there will be some damage to the house. Use a comma after an introductory phrase or when a complex sentence begins with the dependent clause. When the boys came home from school, they were always hungry. Long ago, we would go out on long drives together through the countryside. Use a comma to separate items in a series – ie a list. Remember to ALWAYS use the Oxford Comma. I’ve been to Germany, France, and Italy. Our goals are customer satisfaction, innovation, and environmental protection. Separate non-essential information within a sentence by using commas. Paul, whose father was the team’s owner, always got picked first for big games. Sarah’s new car, a pink Camry, was stolen last night. Coordinate adjectives (two adjectives which alter the same noun) should be separated by commas. Peter got straight As in class; therefore, he was allowed to play video games. The company won approval for its new product; as a result, their share price soared. We use commas with quotes. We use commas for qualifications and positions when describing people. Paul Harrison, CEO of Microcorp Tech. Finally, we use commas with places. Cities come before states or countries. The dog was hungry, he wanted some food. We can change it in a number of ways to make it correct. The dog was hungry; he wanted some food. The dog was hungry. He wanted some food. The dog was hungry, and he wanted some food. As we saw in the above example, a semi-colon can be used to join two independent clauses in a compound sentence, if the meaning of each clause is closely related. The days were beginning to get shorter; it seemed the night got earlier and earlier. There was a big traffic jam; cars were barely moving around town. Again, in a compound sentence, if the second clause begins with a conjunctive adverb of transitional phrase, use a semi-colon. The two countries had been at war for the previous decade; as a result, brokering peace would not be easy. The dog and cat lived together all their lives; however, they were certainly not friends. If individual items in a list are separated by commas, use semi-colons to break it up more clearly. Important European capitals include Paris, France; Rome, Italy; and London, England. A period should always be followed by a capital letter. Essay Correction: Roads or Railways?